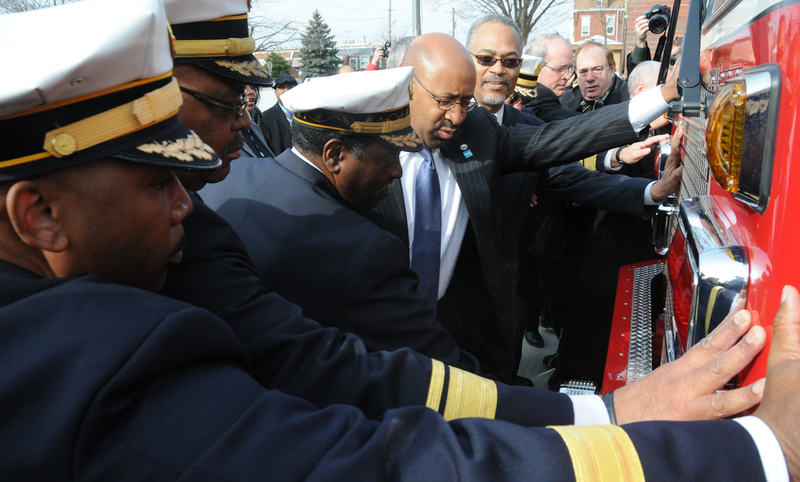 Fire officials and Mayor Nutter perform the ceremonial "push" of the fire engine to open the new firehouse. | Photo by the Philadelphia Fire Department/ City of PhiladelphiaThis Tuesday, Philadelphia added to its growing list of green building achievements when it opened the city’s first LEED-certified firehouse. Built in Disston Park to serve Mayfair and Tacony, Engine 38 Firehouse is LEED Silver certified. The 12,200-square-foot firehouse features recycled materials from within 500 miles, solar panels and a green roof. Other unique elements include a community and training room, and exterior artwork that shows the history of the fire department and the Tacony neighborhood. The original firehouse was demolished when a new I-95 access ramp and interchange improvements were made at Cottman Avenue.